Kingstown is the island's commercial hub and is situated on the Southwest tip. The energetic, fast pace of the weekdays, especially around the busy jetty, bus station and fish market will have you captivated. The one way streets are lined with warehouses and shops and the immaculately white dressed traffic officers wave their gloved hands to direct vehicle through the narrow streets. The weekends and evenings slow down considerably and is a perfect time to talk a walk down the cobbled streets. La Soufrière (French: Sulphur outlet) is the northernmost and youngest volcano on St Vincent. This active volcano’s highest peak is 4,048ft and it has a crater lake, the lake does not fill with water as the ground temperature is hot and the water evaporates. You can either take a vehicle to the top or if you are feeling energetic it can take anywhere from 2 to 7 hours, depending on the route you take. It is always advisable to take a guide. Once you are at the top your breath will be taken away by the amazing views and you will see La Soufrière in all its glory. Trinity Falls is a 40 foot waterfall, with a spectacular display of 3 cascading waterfalls into a circular pool, then a single fall tumbling another 10 feet into a second pool. It is located in a deep set volcanic canyon in the rain forest. The second pool is an ideal place to swim and bath and has warm clean water. Falls of Baleine are located in the northern tip of St Vincent and are only accessible by boat. The waterfall is 60 feet high and cascades into a natural rock lined pool. St Vincent and the Grenadines Botanical Gardens are the oldest in the western hemisphere and was founded in 1762 by Captain Bligh. Located on the leeward(west) side of the island just one mile from Kingstown, these gardens are situated in 20 beautiful landscaped acres and overlook the Governor General’s home. The gardens have rare and exotic flowers, plants and trees from all over the world. It also has an aviary where you can see the St Vincent parrot. Fort Charlotte was built in 1806 and stands 600 feet above sea level just outside Kingstown on Berkshire hill. The fortress was named after King George III’s wife and was made entirely of stone. It stands as a reminder of the islands ample history and richness of its patrimony. The garrison’s peculiar, inland-turned cannons are due to the fact that residing troops of the times feared the sudden attacks of Caribbean Indians more than the methodical assaults of European enemy ships. In its day it would have supported 600 troops and 34 guns. The fort has great panoramic views of Kingston and the Grenadines and is a great place to sit and watch passing yachts in full sail. It hosts the works of a growing number of artists and craftsmen from the islands and some of the old barracks and officers quarters have now been turned into a museum with the colourful history of the Black Caribs depicted on its walls. Port Elizabeth is the islands capital. The quaint waterfront of Port Elizabeth follows Admiralty Bay all the way around and rises into the picturesque hills. Belmont Walkway is a sidewalk that is filled with brightly coloured shops, restaurants, bars, and houses. It has a great view of all the yachts anchored in the bay. As you walk around you will see a benched area under the almond trees, this is called “House of Parliament”. Port Elizabeth is a good place to stock up on provisioning and have a good time. Hamilton Fort can be found on the north shore of Admiralty Bay, in the small fishing village of Hamilton. The Original Fort structure no longer exists; the cannons from France and England were retrieved from the Bequia waters and now are placed where the Fort once stood. The views over Admiralty Bay are spectacular and the visit is well worth it. Moonhole is about a mile from the airport. Private developments with no windows, doors, straight walls and some living rooms even have trees growing through the middle of them. This remarkable creation is built out of natural stone, exotic wood and whalebones and has all natural openings for light. There are 20 houses on this unique property and the development started in the 1960’s. A natural arch of rock, through which the full moon sets twice a year, gave the original house and the location its name. This is a private development and is not open to the public, however, tours can be arranged on Tuesdays by prior arrangement. Old Hegg Turtle Sanctuary is located at Park Beach, just beyond Industry. The Hawksbill turtles have been nurtured by Brother King and he has released over 2000 back into the sea. He looks after over 200 turtles and you can go and see these great creatures for yourselves. Art is very popular for this small island, if you like art culture you may want to visit one of the galleries on the island. Claude Victorine’s Studio, The Boathouse and Spring Pottery and art gallery are to name just a few. 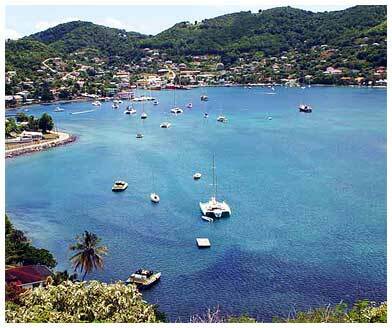 Charlestown is the capital of Canouan and is the largest town on the island. You will find a few shops but everything here is very basic. The Trump International 18 hole golf course was designed by Jim Fazio. Golf lovers will enjoy this emerald green championship course that is set on dramatic sloping hills and along the oceans edge. The 13th hole has dramatic panoramic views of the Atlantic Sea on one side and the Caribbean Sea on the other. The Northeasterly trade winds make this course a challenging and exhilarating round of golf. Mount Royal is the highest point on Canouan standing at 900 feet. Hikers will love the climb through luxuriant vegetation and forests of white cedar. Once you reach the top the 360° panoramic views are exquisite. The small village is located at the top of the hill from Saline Bay. Leave your dinghy at the jetty and walk along the winding concrete road that appears to be vertical. As you start to climb the village will open out in front of you and the little shops and businesses will be lining the road. A little further is a Church and the views from here are well worth the climb. On your way back down you can stop for a drink and something to eat at James’s Island Paradise Restaurant. This restaurant is well known to yachtsman and is usually very busy. 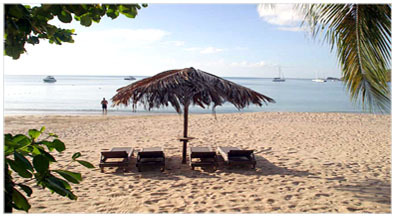 Union Island is the commercial center of the Southern Grenadines; it has many restaurants, shops, bars and an airport. The towns are clean and picturesque and it is a great place to sit and watch the world go by. The market square has colourful stalls that you can leisurely browse around and the people are friendly and helpful. Provisioning here is very good and you will find a wide range of fresh produce and if you are looking for local rum, Ashton has many rum shops. National Commercial bank offers a 24 hour ATM and is open in the mornings for any other transactions that you may need. There are many good restaurants all offering a delight of different ambiances. Lambi’s and Jennifer’s in Clifton and Gedeon’s in Ashton to name just a few. If you are looking for good entertainment than Lambi’s is the place for you. Local cuisine includes; Stew peas, Callaloo soup, Rice and Peas, Curry Goat, Ackee and Satfish, Chicken roti, Seasoned Saltfish and Fried snapper. There are only two towns on Union Island, with around 3000 residents. Clifton is built around the harbor and caters mainly for yachts and fishing vessels. It has numerous boutiques, hotels, restaurant and bars and is the commercial hub of the South Grenadines. Internet cafes and dive operators can also be found in Clifton. Ashton is more of a residential town area for the locals. Ashton Lagoon represents one of the largest wetland areas in St. Vincent and the Grenadines, and contains the largest mangrove forest. Also associated with the lagoon are sea grass beds, coral reef and a salt pond. Fort Hill is a 17th century fort that is located in the north east of the island, standing at 450 feet high you will have amazing panoramic views of St Vincent in the North and Grenada to the south. Mount Parnassus is the highest peak of the island at 900 feet. The lush tropical mountains and hills are home to many birds including the rare Cororico, a pheasant like bird that has a loud chant. This bird is absent from the Caribbean islands and can only be found on Union Island, Trinidad and Tobago. The hiking on Union Island is a highlight, a looping, graveled path parades through a dry forest and nature trails allow you to get close to exotic wildlife and towering tropical trees. Views from the hiking trails are magnificent and you will not regret the walk. Basket Pond is a historic site from the earlier inhabitants of the island. In the rainy season the pond fills and provides and excellent source of nutrients for many birds. This is an exquisite place to relax, have a picnic and take good pictures, bird watching here is some of the best in the Caribbean. Union Island celebrates many festivals to remember their cultural background and heritage. The main festivals are Maroon Festival, held in May three days before or after the full moon. Maroon Festival is celebrated in many Caribbean countries; it marks the beginning of the planting season and this unique festival is celebrated with gusto by the Maroons, the historic descendants of runaway slaves. The festivities include, dancing, music, eating and drinking. Easterval is a four day festival held over the Easter period, there will be sporting events, music, pageants and parades.